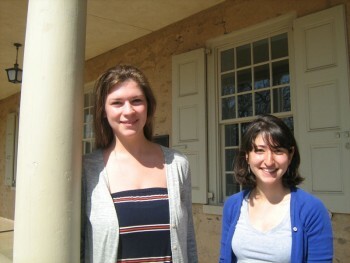 Erin Islo '12 (left) and Maya Barlev '12 will both spend next year traveling around the world on Watson Fellowships. Maya Barlev and Erin Islo (both '12) have been awarded $25,000 to fund yearlong independent projects abroad. Seniors Maya Barlev and Erin Islo have been awarded Watson Fellowships, which fund a year of independent exploration and international travel for newly graduated college students. Barlev and Islo are among the 40 awardees in the Watson's 2012/2013 class who were selected from a pool of 147 national finalists and over 700 initial candidates. Watson Fellows come from select private liberal arts colleges and universities, and receive $25,000 to subsidize an independent project undertaken during 12 months of travel outside the United States. Barlev, an astrophysics major, will spend next year travelling to Chile, South Africa, Sri Lanka and New Zealand for her project,“Eyes on the Stars, Feet on the Ground: How Children Around the World Perceive the Universe.” She is especially excited to go to Chile, home of some of the best telescopes in the world, to see how that equipment impacts local children's understanding of the cosmos. Barlev has always been interested in childhood education and astronomy as distinct pursuits, but her four years at Haverford have enabled her to explore ways she could combine them. Last summer, the College's Center for Peace and Global Citizenship funded her internship with an international non-profit in the Netherlands that teaches astronomy in under-served areas. The Watson Fellowship represents another“unique and fantastic way” to combine her passions. Thanks to a CPGC-sponsored research trip to Romania last summer, philosophy major Islo also has a personal connection to the topic of her Watson-year project: the treatment of orphans around the world.“I spent time at children's centersâ€”orphanages and hospitals for children with HIV, unfortunately the two end up being the sameâ€”to see firsthand how corruption in the government affected Romanians,” she says. Next year Islo will travel to Kazakhstan, Uganda, Ecuador and Germany while researching,“It's a Hard-Knock Life: the Sociopolitical Space of Orphans Across Cultures.” The Kafker Family Scholarship recipient, who transferred from the University of Notre Dame as a junior, credits Haverford's intimate learning environment and need-blind admission and no-loans policies with her success. Sixty-two Fords have received the highly competitive Watson Fellowships since 1973, when the College began nominating students to the program. Watter believes Haverford's success with the program is due in part to the shared values between the Watson and the school, and Haverford students' deep dedication to their individual interests. Meanwhile, Alissa Aron and Isobel Grad (both '11) are currently finishing up their own yearlong Watson Fellowships. Former chemistry major Aron's project,“Reading Between the Vines: The Interface of Science and Art in Winemaking,” has brought her to Spain, France, New Zealand and Australia. She is currently in Argentina and plans to be in Chile soon. Former sociology major Grad has been working on a project,“The Social Value of Local Food Systems,” in Iceland, Madagascar, India and Nepal. Next up: Greece and Poland. You can follow their progress on their respective blogs: Aron's http://nobleroute.wordpress.com/ and Grad's http://aroundthere.wordpress.com/. Read more about Fords who have won fellowships, scholarships or grants.